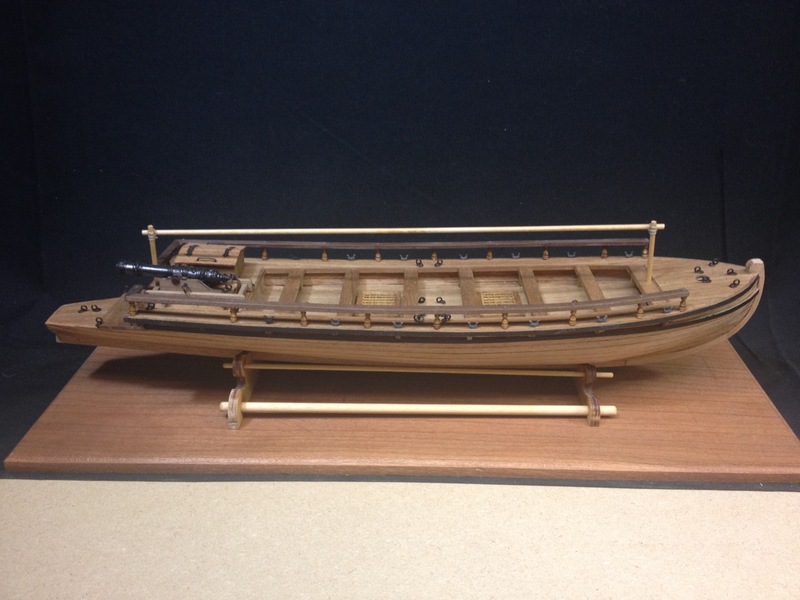 Yes, I CAN finish a non-Japanese boat model! 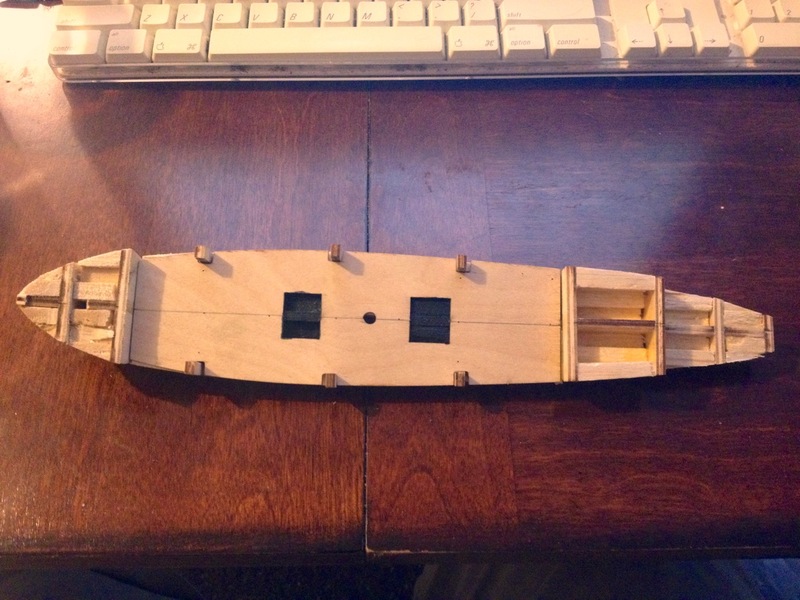 Today, I just put the finishing touches on the Swedish Gunboat that I built from an Amati kit. For those interested it’s also called Cannoniera Svedese, and is listed as AM1550. To recap, this is a very inexpensive small model kit that measures about 13.5″ long when complete. It lists for $109 at Ages of Sail, where this one came from. There have been some challenges, but they’ve all been small ones. 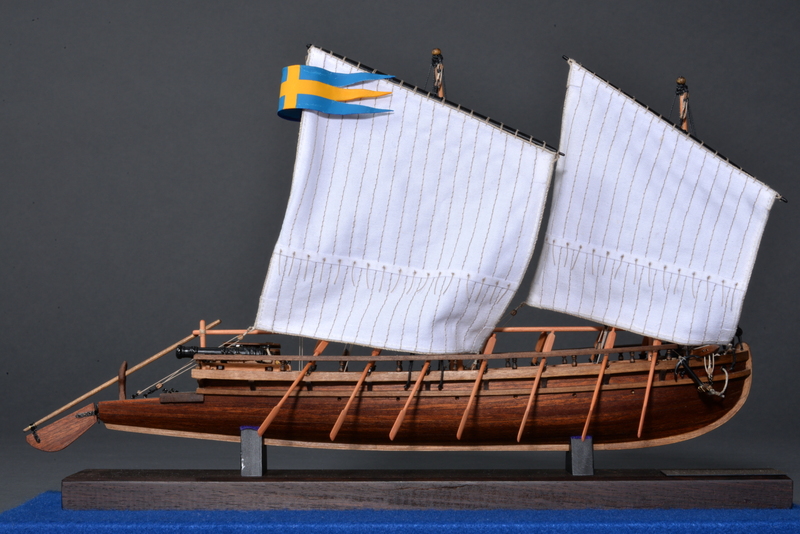 This entry was posted in Ship Model Build Logs, Swedish Gunboat - Group Build on April 13, 2018 by catopower. The Swedish Gunboat project is the closest I have to completion now, and it’s very nearly done, so I decided to put most of my effort there now. My ideas about using it to practice new sail making techniques or other grand thoughts have been set aside. As I mentioned before, the model is mostly being built straight out of the box, but there are a few minor modifications. 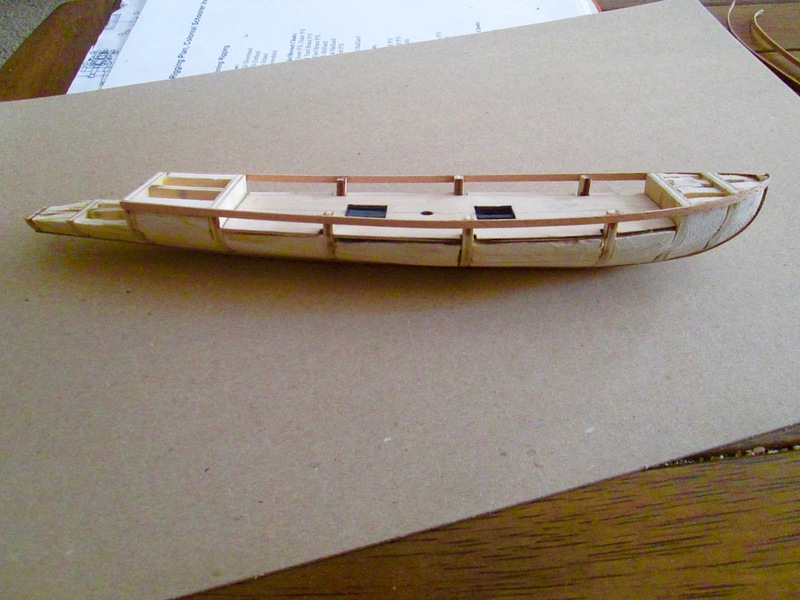 This entry was posted in Ship Model Build Logs, Swedish Gunboat - Group Build on April 7, 2018 by catopower. I shaped the masts and the two lugsail yards some time back. I originally added a ball to the tops of the masts as shown on the kit plans, but replaced them with a thinner pole after looking at the photos of the museum model. The presence of the pole creates a shoulder at the top of the mast, that helps secure the shrouds and stays. While modifying the masts, I also added a pair of cleats at the bottom end of each mast, again based on the photos of the museum model (see earlier posts). 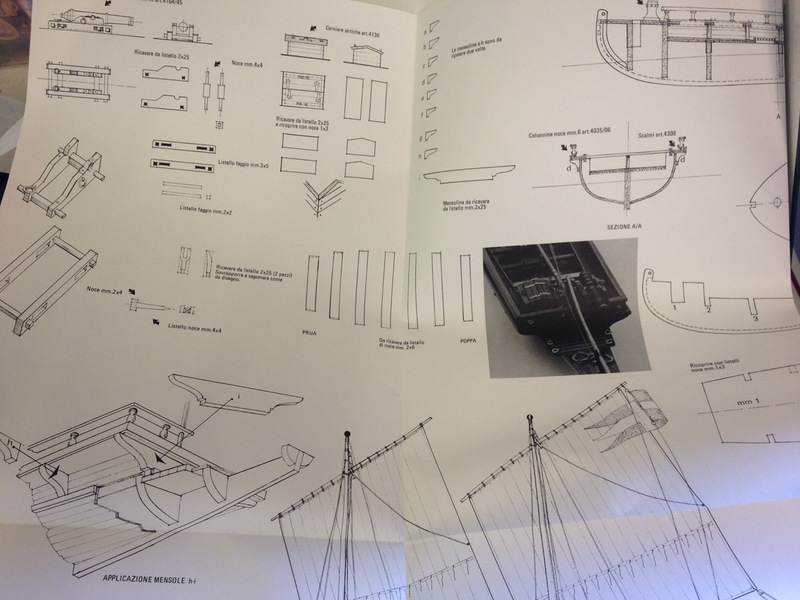 This entry was posted in Ship Model Build Logs, Swedish Gunboat - Group Build and tagged Amati, cannoniera svedese, making sails, swedish gunboat, Wooden Ship Model Kit on November 9, 2017 by catopower. 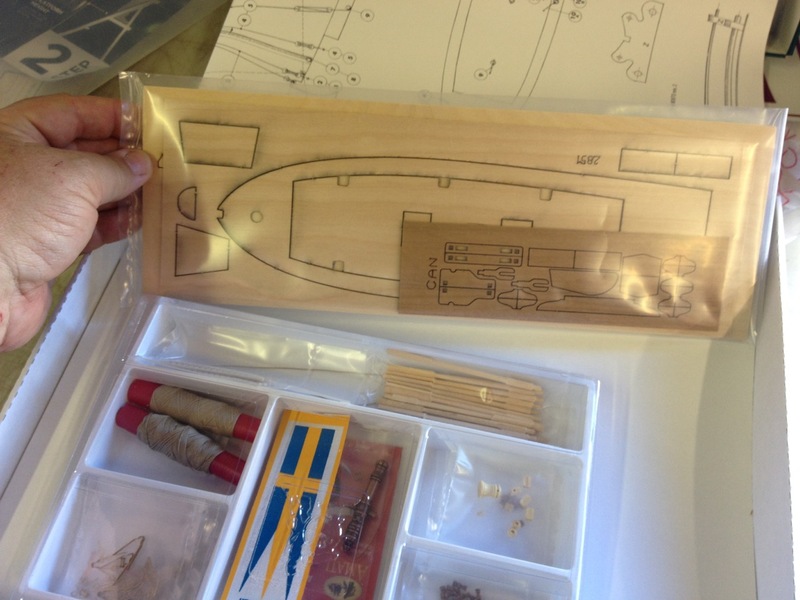 With another ship modelers’ get-together coming up again in just over 3 weeks, it’s time to take a look at our group project, the Amati Swedish Gunboat. Still, nobody has finished their model, but three of us are in striking distance of completion and I’ll be wrapping up my project in the next couple months. I was partly inspired to finish up this model after seeing photos of the model built by ship modeler Junichi Yamashita of the Japanese ship model society The Rope. The model was beautifully done and was part of the society’s 42nd annual exhibition. Below are just a few photos of this nicely done model, courtesy of The Rope. Just scroll down the page to model entry 42-18 and click on the photo. 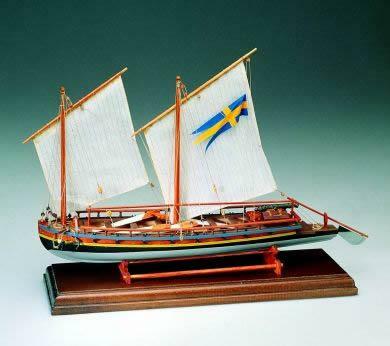 This entry was posted in Ship Model Build Logs, Swedish Gunboat - Group Build and tagged Amati, cannoniera svedese, swedish gunboat, Wooden Ship Model Kit on September 18, 2017 by catopower. Well, I did not end up finish this model for the IPMS show in San Jose in March. I decided to set it aside to let others in our build group catch-up, though I know that two of the members are at least as far along as I am. Anyway, I had work to do to for my display of Japanese boats, which ran from March 1st through the 31st. Then, last weekend, we had a ship modelers’ get-together again at the Vallejo Naval and Historical Museum. It’s been the usual 3 months since our last gathering and it was good to see the fellow ship modelers and their projects again. This entry was posted in Ship Model Build Logs, Ship Modeling News, Swedish Gunboat - Group Build and tagged Amati, cannoniera svedese, swedish gunboat, Wooden Ship Model Kit on April 8, 2017 by catopower. 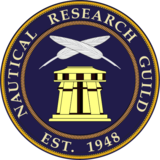 A couple weeks ago, we had another quarterly meeting of ship modelers at the Vallejo Naval and Historical Museum. 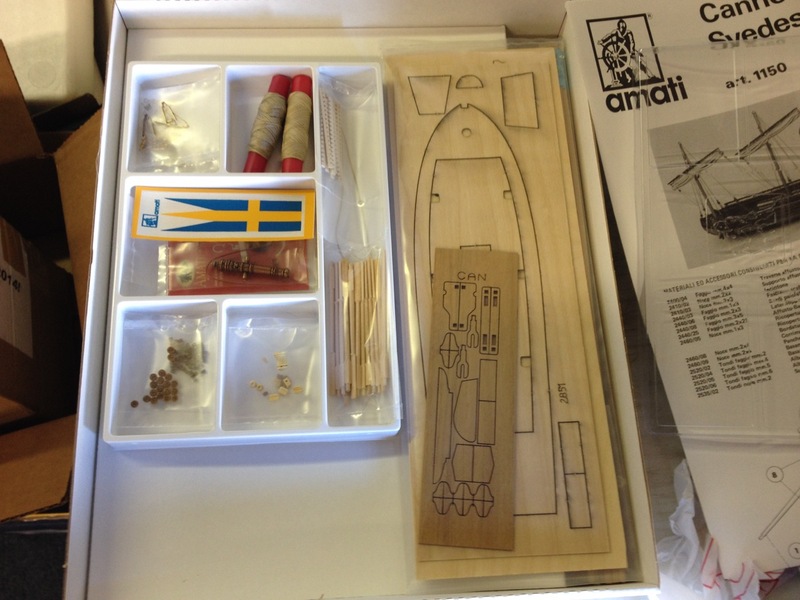 This is the group that includes our group build of the Amati Swedish Gunboat kit. We’ve been getting a lot of rain lately, so it’s literally put a damper on ship model meeting attendance over the past couple months. But, one of the other members of the group build showed up, and it was enough to inspire me to press on with this build. This entry was posted in Ship Model Build Logs, Ship Modeling News, Swedish Gunboat - Group Build and tagged Amati, cannoniera svedese, swedish gunboat, Wooden Ship Model Kit on January 23, 2017 by catopower. This entry was posted in Ship Model Build Logs, Ship Modeling News, Swedish Gunboat - Group Build and tagged Amati, cannoniera svedese, swedish gunboat, Wood Ship Model Kit on December 4, 2016 by catopower. While I haven’t really considered this among my list of current builds, I am continuing this project for our local build group project. There are still 5 of us, each working on his own model. We last got together back in late August, and I have hardly touched it, hoping that those who are a behind will have some time to get caught up. Here are some photos showing the early progress on my model. 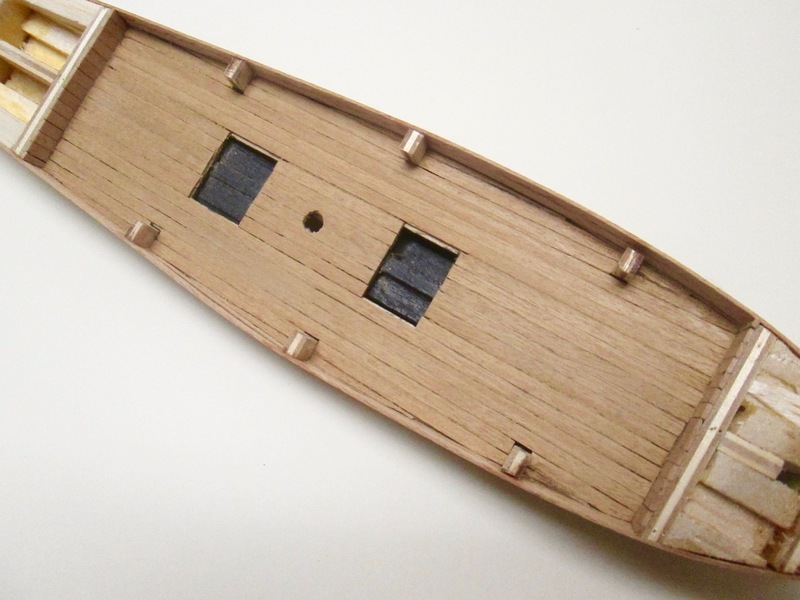 This kit’s hull is supposed to be single-planked using 1mm beech wood. This seemed awfully thin for a single planking layer, so we decided to use some balsa filler blocks to fill in between the frames. This worked out quite nicely. I think it was the first time any of us tried the technique. 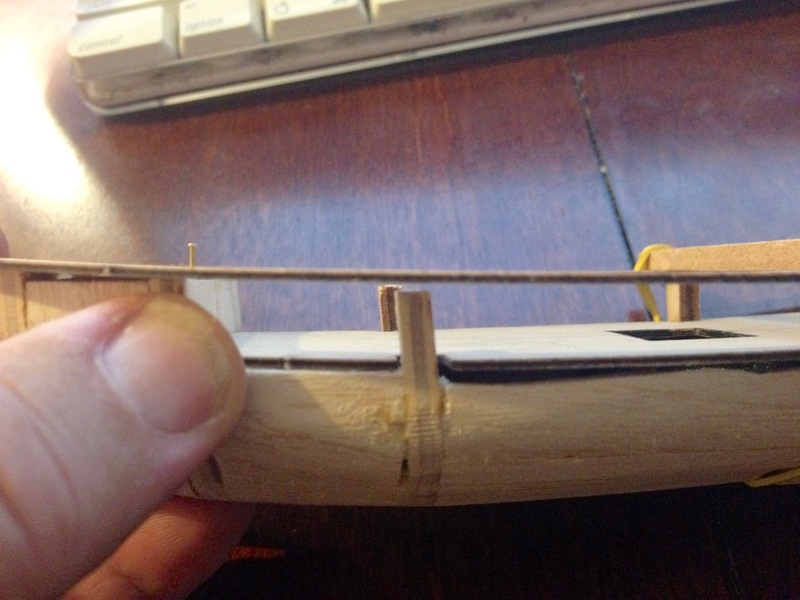 One of the first things I did was to cut away the exposed portion of the strongback/keel. 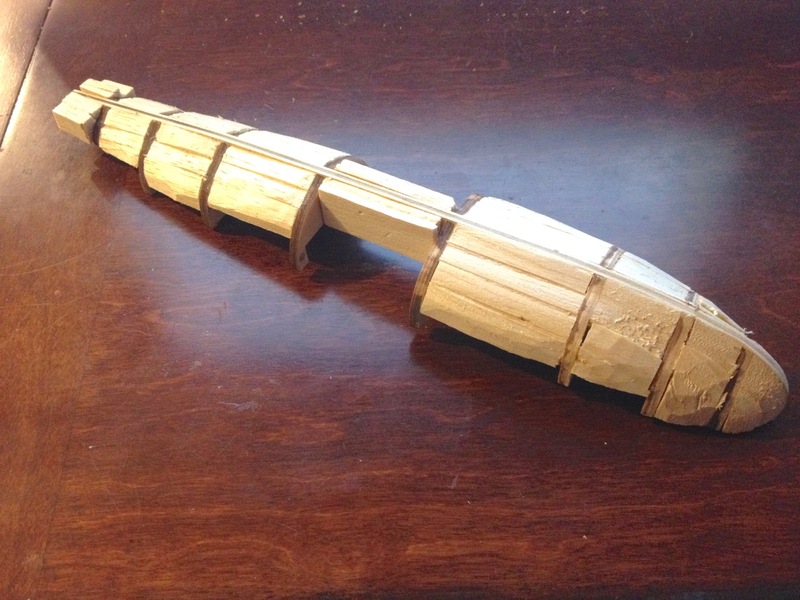 My original plan was to glue down a narrow strip of wood along the keel and then fashion a stem post and keel and attach it into place, forming a natural rabbet. The deck sheet was used to aid in the alignment of the bulwarks. At this stage the hull filler was completed and filed to shape along with the bulkheads. 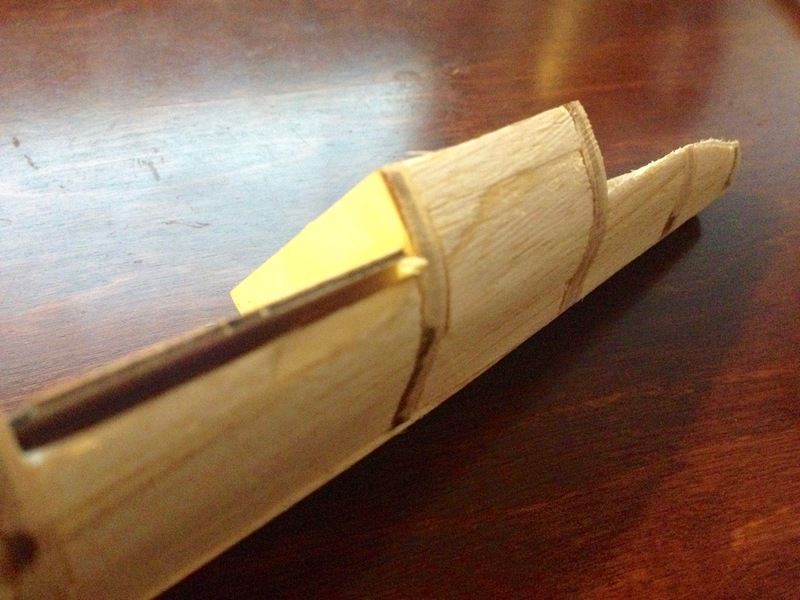 There was a slight droop in the deck sheet on one side, so I used a piece of scrap glued in place to provide support. Before planking started, I used the top deck sheet to help in shaping the bulkhead tops so that the sheet would lay in a nice fair curve. I also used this to help align the upper hull planks. butted the planking up against it, figuring I’d add a keel afterwards. After adding a few planks on each side, I then added the deck planking and the lining of the bulkheads at each end of the deck. 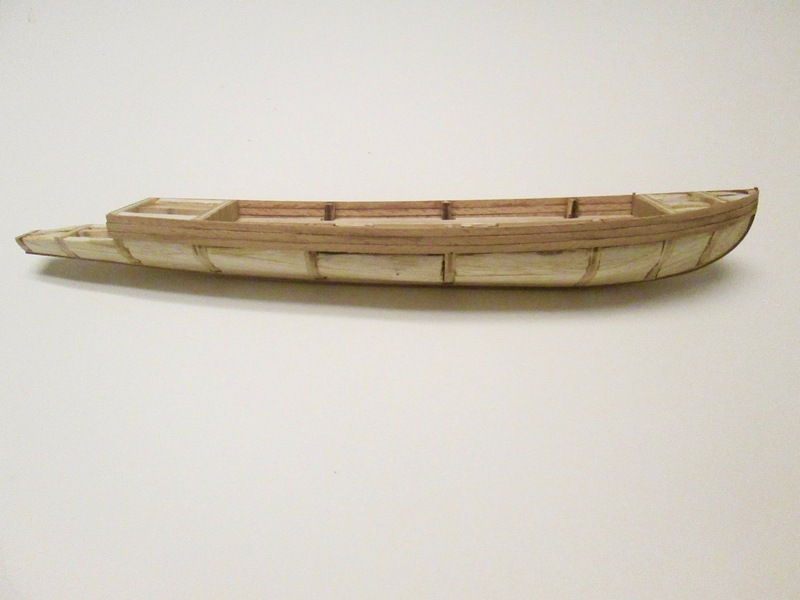 To simulate caulking, I edged the deck planking in pencil, which I also did with the hull planking. I could have actually waited until a later stage to plank the deck, but I always enjoy deck planking, and wanted to make some headway before getting back to the hull planking. This entry was posted in Ship Model Build Logs, Ship Modeling News, Swedish Gunboat - Group Build and tagged Amati, cannoniera svedese, swedish gunboat, Wood Ship Model Kit on October 16, 2016 by catopower. 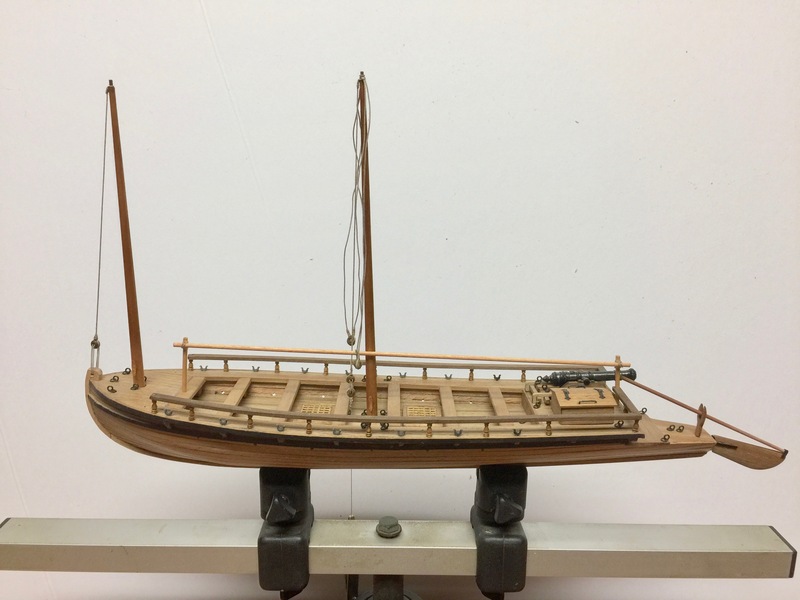 Being that physical location of the ship model store and distributor Ages of Sail is pretty local to all of us, we decided to go with an fairly simple, inexpensive kit they carry by Amati. Part of the decision was price based and availability of enough for all involved in the project. There were a couple ideas in the running, but we ended up agreeing to work on Amati’s Swedish Gunboat kit, sometimes listed in Italian as Cannoniera Svedese – 1775. 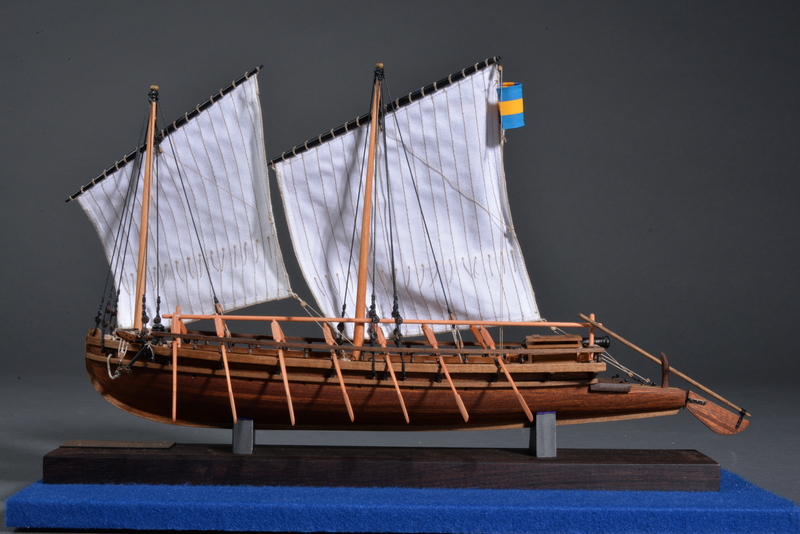 It’s a fairly small model with single plank-on-bulkhead construction, simple armament, a light amount of rigging and sails. The completed model measures just under 14″ in length. Though it’s not actually listed anywhere, according to an email from Amati (and thanks to ship modeler Bill Bunderson for contacting them about it) the scale is roughly 1/50. Here’s a peek at the components of the kit, which sells for $109 at Ages of Sail. Our group bought five of the kits and officially started construction and had our first build meeting just about 2 weeks ago. Some interesting things about this kit is that it is single planked using beech wood strips. Also, you have to be really good at working with basic drawings as the one sheet of plans is all the instruction you get in the kit. As we’re discovering, if you’ve built ship models before, this seems to be pretty much a non-issue. Of course, it helps to be involved in a group build as you can discuss everything with other group members. As for accuracy, there are a few small details that I’m questioning, like the mini capstan located immediately behind the foremast, but as we have been researching the subject on the Internet, much of the design seems to be fairly reasonable. So far, I would say this is a neat kit of an interesting subject and is working out great as the subject of our group build. Also, the dynamics of everyone working on the same kit is definitely inspiring and I think we’re all learning something from the project. For one thing, I learned how to create an online forum (it’s a private forum just for this group project) using tools available from my web hosting service, Godaddy. In terms of history, I knew nothing about Sweden, her Archipelago fleet, her war with Russia, any of her naval engagements or, finally, anything about her gunboats. So, this has been quite enlightening. I don’t know how accurate this kit is. But, it’s been a fun and interesting build, and I’m really glad we decided to do this. I’ll post updates as we go. Stay tuned! 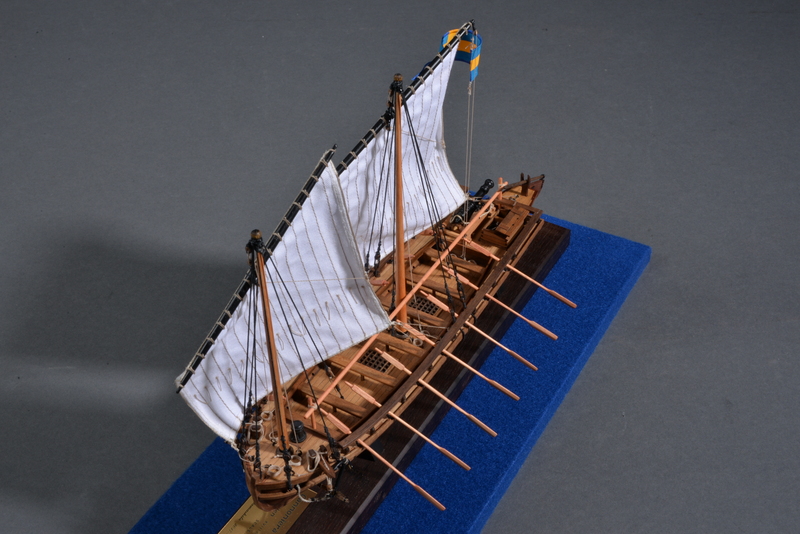 This entry was posted in Clubs and Organizations, Kit Reviews, Ship Model Build Logs, Swedish Gunboat - Group Build, Vendors and tagged Amati, cannoniera svedese, group build, swedish gunboat, Wood Ship Model Kit on July 28, 2016 by catopower.